On July 4 2013, Narendra Modi, chief minister of Gujarat and putative prime ministerial candidate of the opposition Bharatiya Janata Party (BJP), ­became the most-followed Indian politician on the social media site Twitter by crossing 1.82 million ‘followers’, or account-holders who subscribe to his posts. (In the interests of full disclosure, if at the risk of immodesty, I should mention that the long-time leader in this race, whom he eclipsed, was myself.) The occasion was ­enthusiastically celebrated by BJP supporters across the ­internet, and occasioned a spate of analyses in the mainstream media about the growing impact of social media on Indian politics. Mr Modi has since gone on to far outstrip his rivals in India in terms of followers, and is currently the third-most followed political figure on earth, after President Obama and the Pope. When I began tweeting actively in May 2009—providing a few hundred ‘followers’ quick updates on the counting of votes in my constituency during the general elections—I could scarcely have imagined where it would lead, the controversies it would envelop me in and (partly as a result!) the way in which India would become one of the world’s leading countries in the use of Twitter. The idea of being able to reach a wide (indeed global) audience in short bytes of text not exceeding 140 characters is a deceptively simple one that has captured the imagination of millions. Twitter is an extraordinary broadcast medium—an interactive Akashvani. Inevitably, movie stars and sportsmen are the biggest tweeters with the largest followings (my brief reign as India’s most-followed Tweeter ended just short of the million mark when I was rapidly overtaken, first by Sachin Tendulkar, then Priyanka Chopra, Shah Rukh Khan and Amitabh Bachchan, who have all climbed far ahead in their Twitter fan base). But Twitter has a place in our public life too. Just seven years ago, when I first went on Twitter, it was fashionable for Indian politicians to sneer at the use of social media. Every remark of mine was taken out of context in the press and blown up into a political controversy. The then BJP President, Venkaiah Naidu, even presciently warned me that “too much tweeting can lead to quitting”. In September 2012, the Economic Times carried an article showing that, faced with such resistance, most young Indian politicians were not even active on any social networking site. Few ministers or members of Parliament even maintained any such account, and many of those accounts saw only sporadic—and uninteresting—updates. The journalist and poet Pritish Nandy, interviewed in that article, remarked that even he had more followers than the then prime minister, Manmohan Singh, on Twitter (he had 225,000 to Singh’s 195,000 or so) at that time. Others interviewed in that article made it clear that they had no intention of adopting social media in the near future. Yet, the last three or four years have shown a dramatic ­acceleration in the pace at which the political world is ­embracing social media. There is, of course, the BJP’s wholesale adoption of Twitter—Modi’s allies in the space included the then leader of the opposition, Sushma Swaraj, and a cohort of organised supporters, and now that he is prime minister, his entire Cabinet has been instructed to emulate him. Indeed, social media is the PM’s instrument of choice for conveying his messages to the countries he is visiting, including in their own languages. But other prominent Indian politicians of all parties have leapt in too. Just a day after he was sworn in as the president, Pranab Mukherjee announced that he would be opening a Facebook ­account to receive and respond to queries from the public. The chief minister of Bengal, Mamata Banerjee, runs a popular and widely read website that the media mines daily for new stories about her views. The youthful former chief minister of Jammu and Kashmir, Omar Abdullah, regularly interacts on Twitter, and his much older Rajasthan and Kerala counterparts, Ashok Gehlot and Oommen Chandy, opened accounts on Facebook as well when they were CMs. More than half the UPA’s Council of Ministers went online, and the official number for the current council is 100 per cent. Even the statistics-dispensing Planning Commission opened an ­account on social media under UPA, before it was summarily abolished by the NDA. Aside from Mr Modi’s personal ­account, which has an eye-popping 23 million followers (as of 25 September), the prime minister’s official Twitter account has multiplied its following more than ten-fold since Mr Modi’s election, to 13 million today, 13 times more than Mr Nandy has reached. Having ‘followers’ doesn’t mean they are all fans, friends or supporters—many follow you just out of curiosity, some just to attack you. But they are an audience. Political issues are being raised and debated regularly, and boisterously, in the social media space. The UPA ­finance minister spoke to the public about the Union Budget, not on TV, but in a Google Hangout; the NDA’s railway minister and minister for human resource Development have emulated him. The BBC reported how even 15 per cent of India’s population—which is the extent of our internet penetration today, according to a World Bank 2016 estimate—is sufficient to make India the world’s third largest internet market, and also the fastest growing for our size, expected to overtake the US (in number of persons online) by 2020. As I discovered during my time in government, I could use Twitter to put out information the mainstream media was not interested in. While I was minister of state for external affairs, I used Twitter for India’s ‘public diplomacy’. My visit to Liberia, for example, was the first ministerial visit in 38 years; my trip to Haiti in the aftermath of the earthquake there was the first Indian ministerial visit ever. Both were ignored here in India by the mainstream media, but through my ­updates and a couple of links I posted, India’s Africa diplomacy and Haiti relief efforts got more widely known because of Twitter. In another example, a girl from my constituency who was amputated in both legs after a railway accident ­received offers of help from across the world in response to my tweets about her predicament. I believe that during my two stints in government, I was able to use social media to demystify governance and sensitise people to the daily life of a minister. And after leaving office, I have been able to expand my conversation with politica­lly-engaged people around the globe. Of course, I didn’t share any sensitive information from any political or government meetings on Twitter, but politicians all over the world are tweeting. President Obama has millions of ‘followers’ on Twitter and Hillary Clinton, as secretary of state, was tweeting eight to ten times a day when she was on her official visit to India. The UK government encourages frequent use of Twitter and even issues guidelines on effective tweeting. Several current and recent foreign ministers—Bahrain’s Khalid Al Khalifa, Norway’s Jonas Store, Sweden’s Carl Bildt and Australia’s Kevin Rudd—tweet frequently, as does former British foreign secretary David Miliband and Canada’s former leader of the opposition Michael Ignatieff. My own view, as a pioneering Indian politician in the social media space, is that this conclusion is somewhat premature. 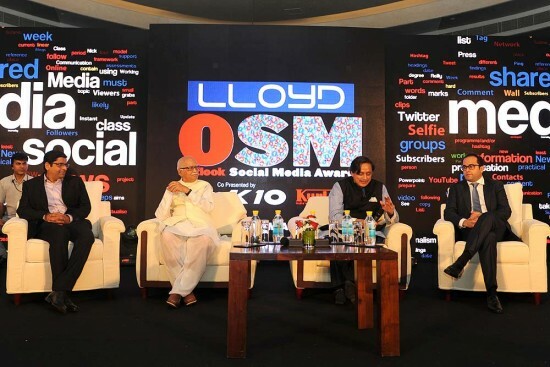 I do not believe, given the numbers, that any Indian election can be won or lost on social media alone. Only a small minority of India’s 753 million voters use social media; with constituencies (electoral districts) of some 2 million people each, Twitter is of little help in political mobilisation. Unlike the US, for example, Twitter would be useless for organising a mass rally or even convening a large public meeting. Social media cannot be a substitute for conventional campaigning. Yet, it can serve to help set the agenda, because the traditional media—newspapers and television, which do reach most voters—do tap into social media for information about and from politicians. The indirect impact of social media makes it an indispensable communications tool for politicians. This will certainly become even more important when developments in internet availability on mobile telephones, and the advent of 4G services, make access to ­social media more universal. Though only 12 per cent of Indians use computers, more than 70 per cent have mobile phones, but very few currently find it easy or affordable to use them to access social media. But smartphones are getting cheaper, and data on 4G is becoming accessible and affordable. Telecommunications experts say that revolution is only a few years away—and when it occurs, it will transform the nation’s social media space, and politics as well, since a majority of voters will then be on the internet. That is not yet, and probably not for the next one or two general elections. But in any case, no democratic politician should resist a new communications medium, particularly an interactive one—even if some seem to see it mainly as a public relations tool. Mr Modi’s triumph has not noticeably been marred by widespread accusations of the BJP creating ‘fake’ accounts en masse to boost his follower count. Even doing so shows how Twitter has come to matter in India. As the first government official in India who engaged with the general public online on Twitter, I can feel some satisfaction that more and more politicians are online today, issuing messages and actually answering individual questions online. The advantages are clear: one acquires a new, young, literate and global audience for one’s views and activities. By being accessible, we earn goodwill. By providing accurate and timely information and opinions, we eliminate the risks of misrepresentation or distortion of our position by others. The pitfalls of using Twitter are the ever-present risk that something said on a social network could itself be taken out of context by our critics. Responses to questions are particularly vulnerable to being issued in haste and without the usual careful vetting that more formal statements or articles undergo. That is, of course, how I went wrong at first. When the government’s austerity drive of 2009 was announced, a pro-BJP journalist asked me on Twitter, “Mr Minister, will you travel cattle class?” And I replied, I thought wittily, “Absolutely! In cattle class, in solidarity with all our holy cows.” The resulting controversy taught me that what you intend to say is less important than what people understand. Since both the questioner (Kanchan Gupta) who used the ­expression, and I, who repeated it in my response, know that ‘cattle class’ refers to the airlines’ way of herding people in like cattle, rather than to the people themselves, I was bewildered to find myself excoriated as someone who had spoken disparagingly of ordinary people by equating them to cattle! That basic error—of using an expression that is commonplace around the world, but not understood in India—continues to haunt me. As Shakespeare knew, the success of a joke lies not in the tongue of the teller but in the ear of the listener. It’s important to realise that Twitter is only a vehicle—the message is the issue, not the medium. As an MP who through Twitter can reach more people than the largest mass rally can, I believe that what I am trying to do brings into my party’s ambit a large number of people who would otherwise be indifferent to politics and the Congress. That’s why, after all the criticism, so many leaders have taken to the medium. I just need to take care to ensure that the message is not misunderstood. The idea has always been to inform and engage, rather than to indulge in (misquotable) repartee. Yes, being responsive on Twitter—though it adds to the sense of public accountability that is invaluable in a democracy—creates its own challenges. Sushma Swaraj has already blamed Twitter’s 140-character limit for an imprecisely­-worded message about the prime minister that created political ripples within the BJP. Of course, there is the safety net that politicians can always type, delete and retype before pressing enter—but Ms Swaraj reportedly dictates her Twitter messages, so perhaps that is more difficult for her! There is the ever-present risk that something said on Twitter by a politician could itself be taken out of context or misused by our critics. I remember well-wishers urging the then Jammu and Kashmir chief minister, Omar Abdullah, to delete a light-hearted remark that could have been maliciously distorted by his political enemies. He did so, with the curious result that the advice to delete can still be found on Twitter, but the potentially offending remark itself has disappeared! More recently, there was the celebrated episode of the PM wishing Afghan president Ghani a “happy birthday” on the wrong date (provided by Wikipedia). More important, perhaps, for a politician is the possibility that any impact of a social media message will be transient and short-term, since social media tends to move rapidly from the issue or trend of the moment to the next issue or trend. Some bureaucrats have ventured into Twitter, with the best-known example probably being former foreign secretary Nirupama Rao. She, in turn, may well have been inspired by the success of the ministry of external affairs’s public diplomacy division, whose officials, with my active encouragement, set up a Twitter page and have been pursuing social media strategies, including a Facebook page and a YouTube channel, to let people know about what Indian diplomacy is up to. This has enabled them to promote India’s ‘soft power’ by creating goodwill among social media users, whether in India or abroad. But Twitter offers more than the seductive pleasures of gaining attention for your own views. Like other social media, Twitter can help you create knowledge networks, disseminate information and keep track of the world around you well ­beyond what is available in our daily newspapers. The links posted by people I follow on Twitter give me a wider range of information and ­insight than any single newspaper can. It also allows strangers to connect on a level playing field; for instance, I have made a number of connections to foreign opinion-makers through Twitter, a forum that doesn’t belong to either of us but provides us a neutral platform to engage on issues. Yes, there are ‘trolls’ and other nasties to insult you periodically or badger you on ­issues that matter to them but not to you. Sometimes I indulge them and even ­respond mildly; sometimes, when their language becomes too offensive, I ‘block’ them from reaching me. A few rotten app­les can’t ruin the entire Twitter basket. There are dull tweets, over-earnest tweets and repetitive ones. Most of the celebrities on Twitter use their accounts for self-promotion. Once you understand that, you can lightly skim over the less ­interesting tweets, because the rest might offer you great riches. Twitter has also proved enormously useful in recent ­humanitarian disasters in Haiti and Japan, helping alert authorities, delivering on-the-spot information and finding missing people. And we know of the role it played in keeping Iranian protests alive after their disputed presidential election, and in helping organise the Cairo protesters who led Egypt’s Jasmine Revolution. There’s something dangerously addictive, of course, about being able to reach so many people so easily and with such little effort (how long does it take you to type 140 characters?). ­ And when you send your tweet out, you are inevitably curious about others’ responses, which makes you return to your timeline again and again. So rationing one’s Twitter time is essential, or it can take over your day. The name Twitter initially put me off, and led Indian savants to suggest that it is not a suitable medium for a serious politician—but Google and Yahoo were also silly names once. In an interview in late 2009, I said (in print) that I was convinced that a majority of politicians in 21st century democracies—­including India—would be tweeting within ten years from now. I didn’t have to wait ten years to be proved right. Those who are ahead of the curve are rarely appreciated, but we do have the consolation of knowing we got there first.